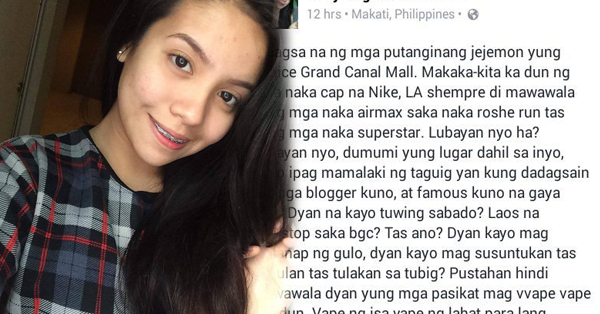 VIRAL: Girl's Open Letter About the Venice Grand Mall Visitors Enraged the Netizens on Social Media! The Venice Grand Canal is one of the newest attractions by the Megaworld Corporation. It is a lifestyle mall like Eastwood, Newport Mall, Burgos Circle and Mckinley Hill where you can dine, shop and enjoy your day. The construction of the mall is somewhat alike with the Grand Venice Canal in Italy. It is a part of the city where tourist and locals are using Gandolas in travelling instead of using cars and roads. Netizens are very excited to visit this newest attraction in the Philippines. But one girl named Mary Angelica Samonte is not-so-happy on the fact that people went to the Grand Canal mall to enjoy the scenery and appreciate the holiday. In her post in Facebook she stated that she’s not happy with the way the place was crowded with “Jejemon” people wearing Nike and LA caps especially those who are wearing Airmax. She even highlighted those bloggers that are there to witness the beauty of constructions. 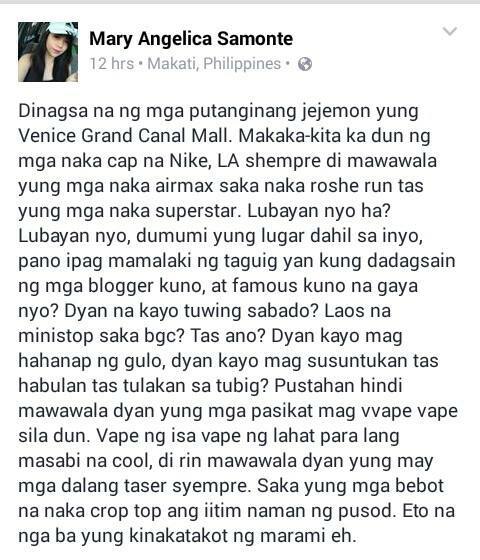 Mary Angelica also has a bad blood on those girls that wearing crop top and people using vape. Don’t know what this girl is looking for. She received different criticism from netizens and even bashed her stating that she is beautiful with no brain. Check her post for you to see and tell us what you think. damn is this girl stupid or what! Make sure to taste your words before you spit them out. If you got nothing good to say better shut your mother fcking mouth. Hindi Sya Stupid Plss Wag Kang May Masabi Lang Ahh Kupal KA Ba Hindi Mo Sya Pinapalamon At Hindi Mo Sya Kilala Mabait Ung Taong Un Gago Ka ./. i bet..hahaha, feeling sossy pero ang mura pang kanto.. hahaha i wanna check her account kaso di ko makita.. True. Jejemon din tawag ko sakanila. malala yung tawag sakanila ng friends ko.. "tam" "mod" mga bagets kasi na nagkalat hahaha. Those people who lived in taguig will indeed understand what was her opinion/sentiment all about. To those who bash her, you were just stating that you'll like her. I am not defending her, or whatsoever. Atsaka doon sa minumura si Angelica like stupid, hypocrite etc. Oh please ! You were just proving na may ugaling kanto din kayo. In her post she has a point, i agree. But judging someone was literally a sin, pero yung iba din naman jinujudge din siya dahil lang sa post niya. Kung kayo ay nakatira sa taguig, you will definitely understand what she was posting all about. This is my opinion. Lahat ng lugar mapasosyal man yan o mapamasa, lahat may karapatan. Wag maramot, di ka magiging masaya pag ganyan ka. Puro galit, inggit at insecurities ang nasa puso mo ineng. I think she just expressed her sentiments. What's the point of bashing? Marami naman sa nangba-bash, nakisawsaw na lang din. Let those without sin throw the first stone. You people, tsk. Expressing sentiments has limitations and she crossed the line when she threw the stone first. mali lang talaga pagkakaintindi ng ibang tao sa post niya.wag kagad magbabato ng masasakit na salita sa kanya kasi di niyo alam yung pinagdadaanan niya. pakabobo naman kasi ng batang yan. sana man lang inisip nya muna mga pinagsasasabi nya bago nya pinost. problema kasi minsan masabi lang na di sya jejemeon pati kapwa jejemon nya ibabash nya.